Week four is a short one, and uneven for the two calendars – Liberty choosing to give us 25 days on their advent instead of 24. Not that I’m complaining! Day twenty-two – Liberty lavender and wild chamomile soap. I had this last year and couldn’t bring myself to open the beautiful packaging. I think I will now though – it’s silly to keep things for ‘best’. Day twenty-three – Une Nuit A Bali dry shampoo. This is exciting – something I’ve never heard of before. It’s a powder rather than a spray, so I’ll give it a go! Day twenty-four – Eve Lom cleanser. I want to like this, but I just can’t get my head around the smell. It’s the same scent as the Eve Lom cleanser I got last year, and it just makes me feel queasy. Skin feels nice though. Day twenty-two – REN Flash Rinse 1 Minute Facial. I’m never going to complain about more REN stuff. This is very exciting. Day twenty-three – Stila lip glaze. I remember being a teenager, taking my first steps into the make-up world, and this lip glaze was the first lip product I tried. Super happy to get this for twenty-three. Day twenty-four – Morgan Taylor nail varnish. Not heard of this brand before, but I’m sure I’ll be painting this on my nails shortly. And that’s it all over for another year. 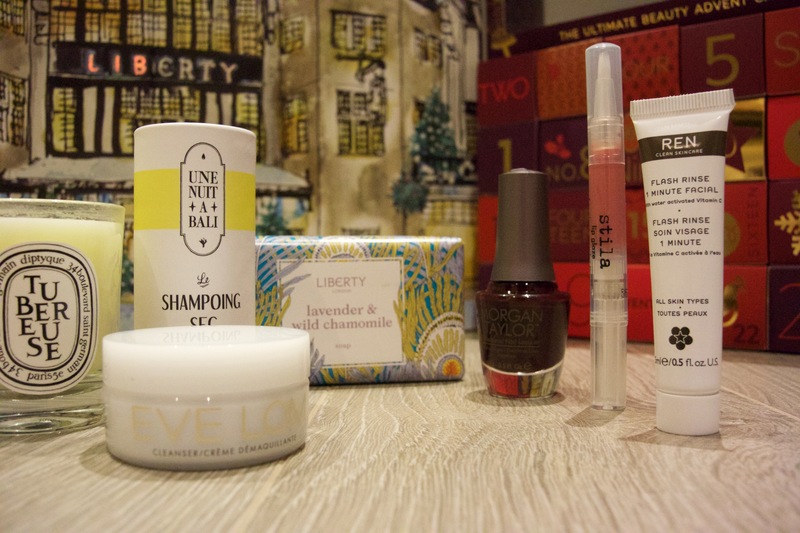 I think if there weren’t as many repeats of last year, Liberty would have stormed into the lead – they did up their game from last year by adding hair care products, not as many body lotions etc and I love all the new brands they included. However Marks and Spencer did good too – I love their beauty hall, and this was a great representation of what they offer. The main problem I have now is that my bedside table is completely overrun with miniature products. Dozens. I won’t need to buy any beauty items for the next few months anyway! I’m off to enjoy my Christmas now. WOO!